The Cordema 3 strand twisted PP Film is a high quality 3 operation rope made of polypropylene that floats in water. 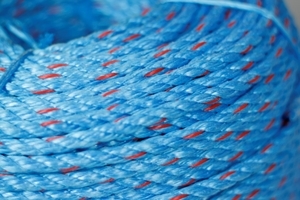 For a low cost this rope provides a good ratio between breaking strength, lifespan and price. Every one of the three strands consists of five individual strands which is what gives the rope its quality and strength. Polypropylene maintains its flexibility both in dry and wet conditions which makes it relatively easy to splice. UV-stabilized, blue with a red tracer.